Alcohol Denatured, Water, PEG 4, PPG 11 Stearyl Ether, Fragrance, Eugenol, Linalool, Limonene, Geraniol, Benzyl Benzoate, Disodium EDTA, Cinnamal, Citral. None Drys out Face Caused more Breakouts Never in a million years would I recommend this product. I understand chemicals like this take a while to work, but two days of use with these pads completely clogged my pores. I know have several large cysts. Do not use this product. Very effective at preventing pimples Salicylic acid instead of benzoyl peroxide Affordable Strong smell (I kind of like it) I went off of oral contraceptives about 6 months ago (after 5 years of use) and my skin broke out immediately afterward. I tried products with benzoyl peroxide and broke out in hives on my face and neck (I think I'm allergic...). 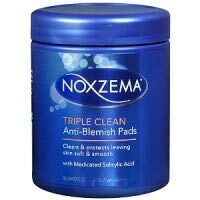 Anyway, the Noxzema pads use salicylic acid and have really helped to prevent new pimples from coming up. I use them wherever I tend to break out (e.g. face, chest, back, shoulders) twice a day since they are pretty cheap. I still get pimples around my period, but that's normal, and they are minor breakouts. Overall, the improvement was like night and day even after only a couple of weeks of regular use!